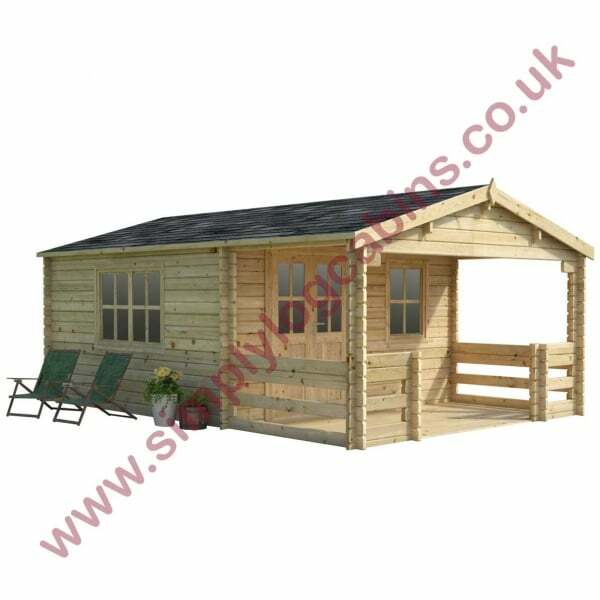 Eurovudas Muston Log Cabin: The Eurovudas Muston log cabin is a spacious 4m by 5.85m, with a light and airy interior. The cabin is sturdily made from 68mm North European Spruce wall logs, which feature a triple interlocking tongue and groove board construction to prevent ingress from water and draughts. The cabin is accessed via a veranda which has 26mm thick terrace boards and a 1.86m canopy. The front of the cabin has windowed double doors and a single window, and the side of the cabin features a double window, all of which are double glazed and have double rubber gaskets. The 19mm roof boards have the option of shed felt roofing material and bitumen felt shingles to fully weatherproof the cabin roof. 19mm floor boards are included as standard. An attractive and practical garden building, the Muston will suit a range of purposes for many years to come.